Description: This is an electronic reproduction of the original Ford printed manual. 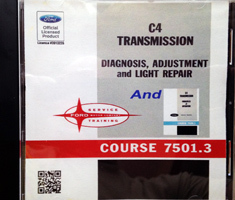 The Ford C4 Transmission Service Training (Course 7500.1 and 7501.3) contains two of Ford's original transmission training courses: C4 Transmission Principles of Operation (Course 7500.1) and C4 Transmission Diagnosis, Adjustment and Light Repair (Course 7501.3). Course 7500.1 has topics covering: Gear Ratios, Torque Converter Operation, Gear Train Power Flow, Control Pressure Flow and Regulation, Control Pressure Flow and Regulation - Engine Is Idling and Car Is Stationary, Converter - In Flow and Regulation, Control Pressure Regulation in D Operation, and Governor Operation. Course 7501.3 has topics covering: Selector Lever Removal Adjustment and Installation, Neutral Start Switch Adjustment, Intermediate Band Adjustment, Low and Reverse Band Adjustment, Diagnosis-control Pressure Check, Diagnosis-clutch and Band Operation, Cruise-0-matic Clutch and Band Cruise-o-matic Clutch and Band Application Chart, Transmission Maintenance, Throttle Linkage Adjustment, and Manual-shift Linkage Adjustment. 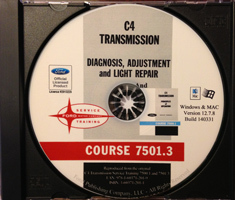 These Ford C4 Transmission Service Training Courses are <strong>not</strong> step-by-step instructions on how to rebuild your entire C4 transmission. Rather, they provide information on the principles of operation, as well as, diagnosis, adjustment, and light repair. Page displayed in: 1.8276 seconds.